Lately, MSI is better known for its Wind netbooks than its gaming systems, but the GT627 aims to change that, as its quad-core power makes it ideal for power-hungry gamers on a budget. The stylish chassis combines brushed aluminium, glossy black plastics and red trim for a striking look, but it is likely to divide opinion. Build quality takes a backseat, as the palm-rest ﬂexes under even light pressure, giving the impression of cheap construction. Weighing 2.9kg, this is a laptop designed primarily for desktop use. However, the 148-minute battery life allows basic mobility for working around the home. A sturdy carry-case is also included, with a matching black and red design scheme. The keyboard is cramped, due to the inclusion of a pad of numeric keys on the right-hand side. Commonly seen on larger laptops, it is out of place on the MSI's average-sized chassis. Punctuation keys are all tiny, and the board bounces and rattles a great deal when typing. The 15.4-inch screen is another unusual design choice, as many of the latest multimedia laptops use wider 16:9 aspect ratio panels. The sharp 1680 x 1050-pixel resolution provides detailed images, but brightness is low, even indoors, which reduces vibrancy of colour and contrast. The key feature is its raw performance. 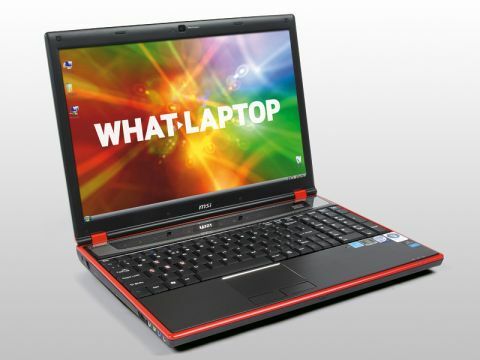 Its quad-core Intel processor doubles the power of most laptops currently available, making it ideal for multi-tasking. You'll need compatible software to make the most of it, but even for high-performance daily use, we found the MSI truly excelled. Above the keyboard, a button marked 'Turbo' lets you overclock the processor. The idea is to push the CPU past its usual threshold for a power boost, but in testing we found performance actually decreased slightly when activated, making this feature entirely useless. Gaming power is excellent, however, and the high-end Nvidia graphics card lets modern games run smoothly. While some rival laptops on the market double the power of this system, they often also cost twice as much, so the MSI strikes a good balance between power and price. The 320GB hard drive provides comprehensive storage space, and lets you run games directly from disk. Rounding out the features, a Blu-ray drive lets you watch the latest high-deﬁnition (HD) movies. on a budget, it has plenty to offer, but it is far from perfect.